These pages describe a sort of blog-ish time log on my 'GameToy' hardware project (stalled indefinitely). 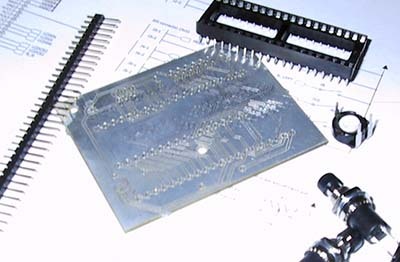 I figured it's time to build the first revision of the hardware, and in order to do so apply the KISS principle, i.e. drop everything that's not absolutely needed at this point. I shopped around for a good box for it, and I ended up selecting a "curver" brand "aroma fresh" plastic box. It is suitably small to fit in hand, but large enough to fit the board, LCD, as well as enough batteries to run the whole thing. It also has a pretty transparent cover, which is what I was really after, so that I won't have to make a hole for the LCD to be seen. For some reason there were no transparent cases in any of the electronics stores that I visited. The fact that the box is pretty much airtight is a bonus, so the toy shouldn't mind getting a splash of water either. I'm not planning to use it in a shower though, as I'll have to drill holes for the buttons.. But anyway. So the short term plans are to put the parts in and see whether it works, and also build the box. Longer term plans are to order a different, but similar, graphical LCD and hope that it will be of a bit better quality than the Lumex one used here, and also to make the whole thing updateable through USB so that it will work as a standalone development platform as well. More (bad) photos later on. Oh well, such is life: this project got stalled due to more important things, and is now in a "indefinitely stalled" state, meaning I don't have high hopes of ever picking it up again. I'll still leave these pages up in case someone can learn something from them. I think the whole project underlines how much more a software than a hardware guy I am..